Hadrian's Wall was an important fortification system in England during the antiquity. It is located in Northumberland, the northernmost of the regions of the North of England. The wall was constructed during the second century AD as a defensive barrier against Scotland to the north. In this video, contributor Ewan Hillier flies along the great wall, which marked the northernmost outpost of the Roman Empire on the island of Great Britain. 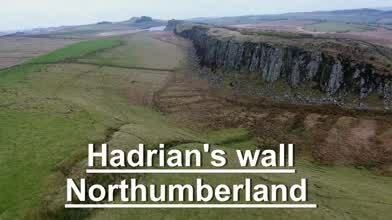 Description: Short video of a small part of hadrian's wall in northumberland England.